You can email me the picture and I;ll post it for you. Again, thank you so very much, I really appreciate it. If anybody wants to see a more up close detailed picture though, I can still email it. I understand on here it probably cant be that big; being so small they really don't show the extent of the problem. I wonder if that lower incisor is cracked at the base - it looks as if it might be in that picture. An xray of his mouth (dental xray done under light anesthesia) should give you a better idea of what's going on with that front incisor. I had a pig who had to have a front incisor removed, and she did ok. 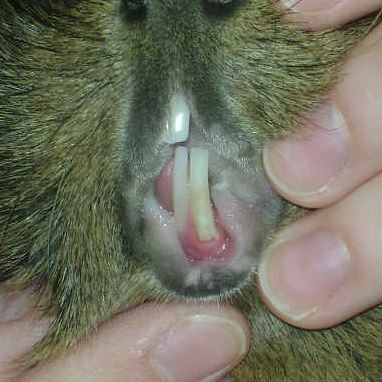 Unfortunately, it's extremely hard to remove the whole root in a guinea pig incisor, and it had to be removed twice. Usually incisor problems are caused by molar issues, but an xray will tell you if that's the case. In my pig's case it was caused by a tooth that was knocked out and became infected (this is rare). You wouldn't want to mess with the incisors without getting a dental xray of his molars as well as the incisors. Thanks so much Mum. I heard that incisor problems are usually caused by molar problems, I am hoping in my case it isn't cross my fingers. But I will now ask for an x-ray first. He actually had an x-ray when he was younger for his stomach, because it is just so big and mushy that I thought he might be bloated, turned out it was just all filled with food, my little porker! Although they didn't need any anesthetic. I am a vet tech student and know all the dangers of them, so it really scares me. Especially since he was on Baytril when he was younger for an URI and almost died...actually after that is when he got the weird mushy stomach. So his health has always been on my mind. I will be calling the vets around here in a few minutes, once they open....I just wonder how closely related guinea pigs are to say beavers, weasels, etc., because the one vet around here deals with wildlife but not guinea pigs, maybe she will be my best bet. I just want to have all the information I can before going in, thank again now I know where to start. Dental xrays are the one xray that do need to be done under light anesthesia. I hope you can find a vet who can do this! Well I made an appointment at the cat/dog, wildlife vet....the receptionist said she treat's guinea pigs. Still not too sure though, I do have my regular guinea pig vet that lives 3 hours away that I could go to. However when Coco had a possible URI (which I really don't think he did) she put him on Baytril I think...that was soo long ago and he stopped eating and got really bad diarrhea so I went back in and she tried to give him a penicillin shot, and I said no, because I read on here that it is bad for them and can kill them. So I don't know if its any better to drive down and see her since I'm not sure if she really knows what she is doing. This really is stressing me out, makes me want to go become a guinea pig vet just so their are more. Thanks for help Mum, I really don't want to sedate him, seeing as that can cause death itself. Marjorie_61, let me know if you'd like me to permanently add your two pics to this thread. Lynx that would be great, thank you. Well I'm off to the vet tomorrow, getting really nervous. I have two last questions before I go. 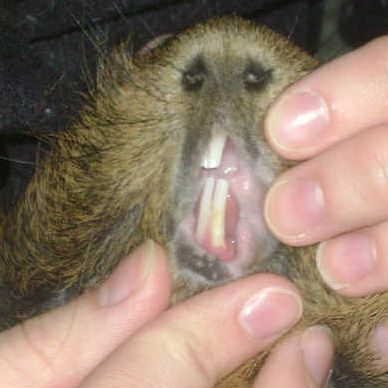 My teachers at school (I am taking a Veterinarian Technician course) who are vets but don't really know anything about guinea pigs keep saying Coco's bottom incisors look too long. What do you guys think? I took Taz out, my other guinea pig and was looking in his mouth for comparison but they look just as long and he is perfectly healthy. Coco is eating fine and acting fine, all except I noticed the harder objects in his cage like his giant "cardboard" tube isn't being chewed at all, when it used to be devoured every couple months. So I am worried to get his teeth trimmed and then he stops eating, when he is eating fine now. I am thinking, x-rays, possible lancing of the abcess if thats what it is, and some antibiotics....although he reacted really badly to Baytril last time he was on it. Also I was wondering how exactly they do the dental radiographs? The pictures on this site basically just show a radiograph of the whole skull, so I am guessing they need to take one from each side? Also how can you tell if the molars are say entrapping the tongue from a side shot radiograph? Anyways these are just some of the questions I have lingering in my head as I head into tomorrow's appointment. Thanks in advance for any advice. His lower incisors don't look to long to me, I wouldn't trim them unless they touched the roof of his mouth IMO. I've had dental x-rays done, in my case they did the whole skull two side views. Tongue entrapment can be usually be seen visually. Is this the same vet that wanted to give your pig a shot of penicillin? If so, you may want to take as much info with you as possible. Print out anything that you think will help, especially the dangerous medications list. My pigs have had trouble with Baytril also, so I always opt for Bactrim which has so far worked well on my pigs problems. Good luck. Wow. That looks EXACTLY like Skittles lowers. He cracked one chewing on his cage (I think) and now it looks a lot like that. I think teeth should be longer than people think they should be. What you watch out for is touching the roof of the mouth and causing injury. Thanks so much for all of your input. I have already printed out every page on medications, anesthetics, teeth, etc. hehe and got the names of all the dentistry vets in Ontario (I live in Canada), as well as all the "Guinea pig vets" (although the one who tried to give him penicillin was on there, so don't know how good the list is). This way the vet I am going to can call another vet for advice if she is not quite sure what to do. I am not going to the vet that tried to give him the penicillin, I am going to a vet with little experience with guinea pigs (but some wildlife experience) who is open to listening to my advice. I am worried about anesthesia as well because I had to sedate guinea pigs, gerbils, and rats at school this year and before each class our teacher would say its not your fault if your rodent dies, some of them can have adverse reactions to the anesthetic. So I am going to try to avoid it as much as I can. He is normally good at the vets because he gets scared and just lets them do anything. With me he squirms and tries to be tough. He has such an attitude and thats why I love him so much. Just a little cute note: when I went to the pet store to get a guinea pig, to keep me company after my 19 year old dog died. There was a female and a male in different cages the female would come right up to you and want attention, Coco just looked at me then turned around to put his back to me and lied down, saying go away and leave me alone...I was in love :) Thanks again, I feel better prepared with all your input, this site is great! I will let you know what happens today. Well I am back from the vet, got x-rays done and not a big surprise but Coco has a big hole in his tooth below the gum line. So since its a continually growing tooth she said to just leave it and it should eventually grow out and break off. She didn't want to put him on antibiotics because of his last experience with them. Not sure if this is the best way to go, seeing that his gums are all red and if it is an abcess it could go into his jaw and eat away at his jaw. But at least I know what it is now. I will be back at home in 2 weeks, instead of up in the middle of now where at school. I found another vet in my hometown that is a dentistry vet and specialized in wildlife. So I will go to him with my problem and see what he says. Also I think I am going to buy some buccal pad separators so I can properly see, or let the vet see the his molars and make sure they are ok. She had one shot of his molars that were actually visible but I don't know what I would see in an abnormality on an x-ray. Anyways thats the update, if anybody knows of a topical antibiotic that could be used in a Guinea pigs mouth that would be great. Thanks for everybody's help! Anybody know if Baby Anbesol is ok to use in my guinea pigs mouth?